With the MU series we offer melting machines for many different demands and with crucible capacities from 155 ccm up to 1,200 ccm. The material is molten in open crucibles and poured by hand into the mould. 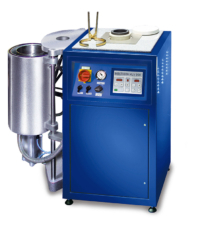 Flexible melting furnaces designed to melt gold and silver alloys and as well as aluminium, bronze, brass a.s.o. Due to the strong induction generator up to 15 kW and the low induction frequency the stirring effect of the metal is excellent. 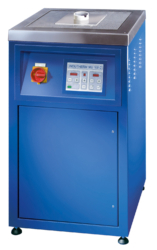 The V-versions include one or two additional extra large capacity vacuum chambers. The evacuation of the flask immediately after pouring improves the form filling, reduces porosity and avoids the oxidisation of the hot metal.